I just currently had an argument with my ISP, and they don't seem to be willing to help me with my line jitters issues. I just posted today about my problems with jitter from my ISP, and I just want to collect as much data on what jitter should look like. So if all of you here on this forum can help me by posting your PingPlotter results, that would would be great! The longer you keep the tests running, the better. Show results by pinging any widely know public IP's or DNS servers. Such as 8.8.8.8, 1.1.1.1, 4.2.2.2, google.com, twitter.com, dslreports.com, or even your ISP default gateways. The more screenshots the better. Thank you all in advance! Try and show me how stable a connection can and should be! Pro edition has ran out so I only have a 10 minute plot. How they can dispute that you have 200ms + jitter hop 1 coming from you modem is unbelievable. 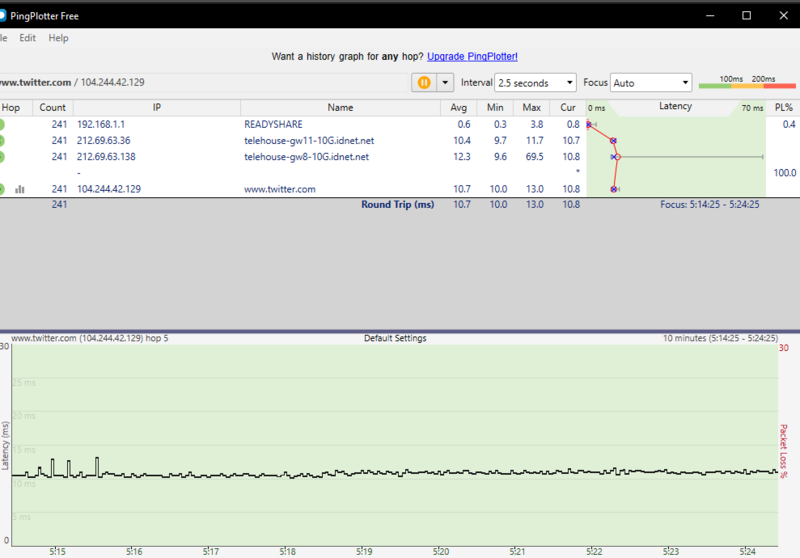 Mine too........Try pinging twitter.com and see what your graph is like rather than just pinging a dns server! My first hop isn't actually my modem, it should be the node outside my house. Anyways, those results are still ridiculous, and I expect to see results exactly like this and nothing less. 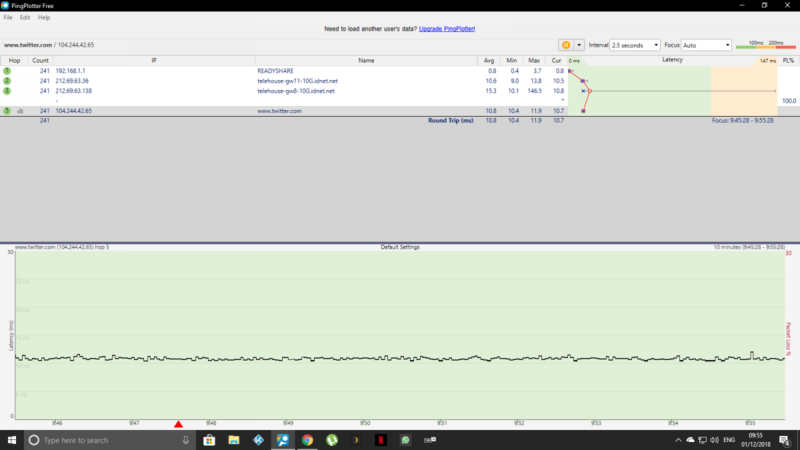 If you could provide an even longer test, even though it is pingplotter free, you can still select ALL instead of AUTO, which will show your average, minimum, and current, and you can also make sure that maximum is also selected to be shown,because without a doubt, I'm still going to get denied by my ISP that any problem is wrong. Any and all of this information should be helpful to me. They just want to see longer results to see exactly what I'm talking about. Would you believe that their twitter support stopped responding to me, accused me of trolling their social media, after complaining, and then blocked me. They literally blocked one of their paying customers from being able to use their twitter support, and then proceed to never respond to any of my email. This ISP is a nightmare. Thank you for this post. 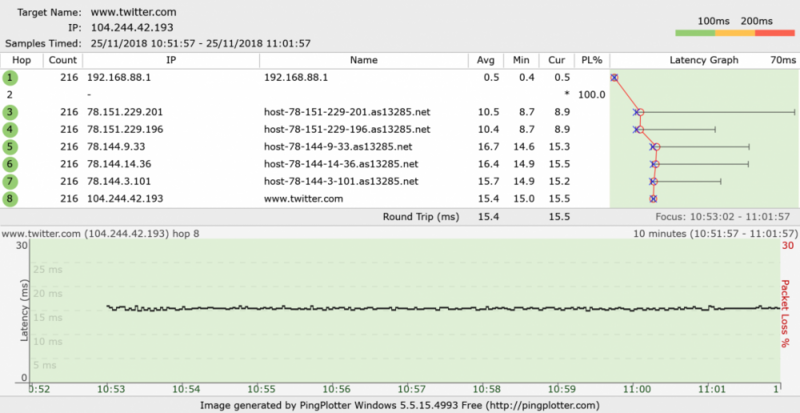 If you could possible run the test for even longer, for as many hours as your can, if you are willing, and make sure to select all instead of auto, so I can see the highest ping and lowest ping over a longer period of time, even though it is only pingplotter free. Thank you very much though! Ah zoomed in I see it is not your modem, things work differently here. For me to actually ping my modem, I would ping 192.168.100.1, but when pinging anything outside my network, it skips that. I actual do have results from pinging twitter. I tried posting it in my other post in this forum, but it wouldn't upload due to an error at that time earlier. I ran the test for 2 hours for you. I had 1 spike during that time of 147ms. That could be down to server switching during the pingplotter test as it does that a lot on bbc's site. So as you can see my connection is very flat and stable. Your ISP wont care about latency, spikes, etc their job is to deliver you a service with a sync rate (at their end, not your own speed test or what your router says) that is within spec that their hack haul provider determines is within the defined limits, that's it. Trying to get engineers out of lines shifted for spikes, latency issues and CRC errors etc is just not going to happen. As long as you are getting the sync you should be that's pretty much it. Only when your line breaks down and fails is when they will come out. You can talk to them till you are blue in the face but these are things that your ISP cannot fix. You have a connection, and its giving you the speeds that you should be getting, so you wont get any further help. ISP's cant fix what is out of their control (your line from the exchange or cab, or DP if you have fibre). The fact you may have aluminium mixed with copper causing reflection if its a copper based connection, or that the copper/Aluminium has corroded, or that the pair in the cab is a little worse for wear, or you have REIN or SHINE or that your ISP is greedy and getting as many users on your pipe as possible by overselling their capacity so when it's busy you get far more contention at the DSLAM. There are so many things that can effect your line including your own RFI issues from cables, heating, air conditioning, microwaves, tbh almost anything electrical. I hope that helps make things clear. I'm not trying to put you down in any way here at all I feel your frustration but you are beating a dead horse. 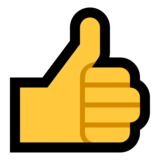 You have a working connection and the things that bug you are nothing to do with the ISP, they just make sure you have a working connection. I use a really good small Niche ISP called IDNet, in the UK, even they could not get the 10Mbps I lost when lazy engineers swapped the pair in the cab instead of fixing a battery (which rarely effects Broadband) You will just have to learn to deal with the issues that bug you in all honesty. Well, thing is, I filed a informal complaint with the FCC, and got a reply back from an executive at WOW! , and they told me that as long as my jitter never exceeds 30 ms, 30 ms from minimum ping to maximum ping, my connection is fine. So, I just did a pingplotter all last night, and my lowest ping to just my default gateway, the node down the street, was 2.8 ms, and the maximum ping was 163.5 ms. Sounds like a problem with them to me. They asked for as many ping results as I could get and show the times it would happen. So I am collecting results of what connection and line jitter should look like, so I can show them exactly what I expect. If you have a problem, always be vocal about it. So I won't stop pestering them to fix this, otherwise the connections just get worse, and people get scammed by ISP's that charge too much for terrible service. Thank you so much. This helps prove my point even more! That my jitter is a problem, and should look more like yours, just like everyone's should. My ISP just fights me when I bring up any problem, so any info helps. What is your provider and what make/model is your modem? It maybe one of the affected puma6 chipset models. My provider is WOW! , otherwise known as WOWWAY, or WideOpenWest. My modem is a Netgear CM1000, Broadcom Chipset, so no, it is not affected. Already been through that experience a long time ago, after having the Arris SB6190, and getting a full refund. ISP's lie thats one thing I found out early on, which is why I went with a small niche provider here in the UK. You seem to have missed the point about line conditions, and unless your ISP laid the infrastructure they have no control over that. Below at the end of my post is what a big backhaul provider in the UK says about jitter. Note the last part "Occasionally, though, problems with latency can crop up due to issues on the line, or on your ISP’s network" that's the get out clause, its wrong I agree but you have to remember when these networks were cobbled together gaming wasn't even really a thing, they were never designed to deal with all this new traffic that is dependant on Latency etc. I wish you luck on your endeavour, but the reality is you have a connection. There are people that would love to have your speeds I imagine because maybe they are in a remote location and their speeds are dismal. These people are the ones that need help right now. I agree things need to change and yes its shouldn't be this way, but the reality is that congestion is also a big part of Jitter and most ISPs run their networks hot, hence they use shaping and throttling to make sure your line gets its fair share at peak times because they have oversold the bandwidth they have. Only when they really need to will they up capacity and get better LNS servers, as that's eating into their profit margins. ISPs want to make money with as little cost to themselves, they are the same as any other business and therein lies the rub. This is another reason I use a small niche ISP. This is what my ISP IDNet state about their service. "We guarantee no contention on our network, no throttling, no traffic shaping & no port blocking. No contention on our network is achieved by not oversubscribing our broadband services and ensuring that bandwidth investment exceeds customer demand. This means that we can guarantee the maximum throughput that your line can support at all times." Below is that quote about Jitter I mentioned from a UK backhaul provider and ISP. "Jitter, is the variation (in milliseconds) in latency. If you have a typical latency of 100ms and zero jitter, gameplay would tend to be very smooth and predictable. However, if your jitter was, say, 100ms then this means that on occasions your latency might be as high as 200ms. Like latency, the goal is for your jitter to be as low as possible. Many gamers talk of ‘latency spikes’ – moments when latency suddenly jumps up to unacceptably high levels. This is invariably caused by the jitter of the connection. Shut down bandwidth-consuming processes on your PC - if you're downloading or streaming something while you're gaming, this can have a considerable effect on latency. Play on local servers - if you're based in Europe, playing on a European server will provide noticeably better latency than playing on a North American server. If the option is there, you should always choose to play on a more local server. A good internet connection should provide low-enough latency and jitter to enable smooth online gaming most of the time and, from this point of view, typically, there will not be much variation between providers. Occasionally, though, problems with latency can crop up due to issues on the line, or on your ISP’s network"
Yes, I know all about what jitter is. I haven't "missed the point about line conditions." THey have control over their own infrastructure, because the lines here from my ISP are fiber, and were laid only in the past year, this is all new infrastructure that has been created, and fiber lines can handle a TON of bandwidth. The speeds I have were only just available last year. I could care less about bandwidth, as that is only half of the what needs to be on point. Line stability being the other half. An unstable connection is unusable for gaming, which is all you see people constantly complaining about. The entire point of this is to keep ISPs honest, as almost all ISPs advertise superior gaming performance on their network, and it should be exactly as they advertise. Also to deal with bandwidth, that's why we have many different download and upload channels, which are seen on your modem. You can see it on ping results all over this entire forum. There are people who get next to no jitter, and I expect nothing less than that kind of stable connection. The entire point of this forum and Netduma product, is to try and eliminate jitter, by means of a state of the art Quality of Service. Consistency is key. Jitter is the difference between life and death in a video game, and everyone knows or should know that. Have you taken your modem and connect it directly to the main line coming into your home and test from there using ping plotter? Connect your modem on the maim feeder line.. I think you have mentioned you have fiber out at the curb and copper to home.. My guess is you have RJ6 coming into your home. Make sure your connector is tight at the modem and not just finger tight. See if your results are any better testing there.. I have done that, and results are ultimately the same. My ISP has denied me another drop to the back of my house that would only be for my modem, so sadly I am only able to have my modem attached to the first split on my coax. Also, here is an email I just received regarding my FCC informal complaint since they hardly reply to my messages and emails to them, showing them my upload speeds never reach advertised speeds, my line has a lot of jitter and lag a good amount of the time, and I even reported a routing error to Cloudflare's 1.1.1.1 DNS resolver. This is how they treat me now that I have informed the government of my issues with them. I now have to wait god knows how long for a response to all this. Phyter my fingers are crossed for you! I do wish you luck. And keep us posted on any new info. Im surprised that WOW doesn't want to resolve this directly with you. I do think in your case you did what you had to do. Lets hope this moves fairly quick for you. Good luck! I posted another tweet to them just showing them again about my slow upload speed. I should be getting at least 50 Mbps up. Guess what my ISP did? They blocked me on both of their accounts on Twitter AGAIN! This ISP is a living nightmare. Link to my tweet from my SECOND Twitter because they blocked me before. Is there a conduct code your provider belongs too for reporting a problem between you and your ISP? I imagine its probably the FCC, but just wondering. In the UK if you cannot come to a amicable resolution with your ISP and it is part of the ISPA you can take things further. I really don't think you will get the line you want for the reasons I posted, jitter is just not important to ISps unless it wrecks your line, but if you are having upload issues with throughput they should help you no matter what. As to twitter I would report them to the FCC maybe, unless you were seen to be spamming them or being inappropriate with your tone or language (not saying you were at all but I don't know what tweets you were sending or how often) I hope you at least get your throughput issues sorted, and I would give up on jitter, its not something any ISP would deal with here in the UK unless your line was unusable due to an actual line fault. I think you may find the same is true of most ISPs even in the USA. Basically if your connection works and passes a line test then there is nothing they will do.